Are strikes still effective in wage negotiation? Wage negotiations are often fraught with labour unrest in the major economic sectors. 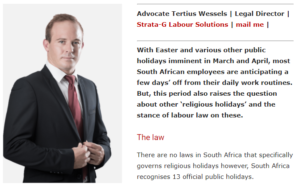 Advocate Tertius Wessels, Legal Manager at Strata-G Labour Solutions, discusses whether workers are able to get better working conditions through strike action. When is the right time to discipline with regards to off-duty conduct? The recent publicity around senior government officials and members of senior management, and their alleged behaviour or conduct outside of the ‘workplace’, raises a number of questions for employers: to what extent does a person’s conduct outside the organisation or company impact on the employer and does the organisation or employer have recourse against the individual? Off-duty misconduct is often viewed in a dim light. Both employers and employees are often under the mistaken impression that no action can be taken against an employee in circumstances where the misconduct is committed outside the workplace. What is the business’s responsibility towards its employees? Retrenchments do not always occur as a result of financial issues, but no matter what the reason is for the possible retrenchments, businesses have a duty to be open and honest with their employees regarding the reasons for the possible retrenchments. 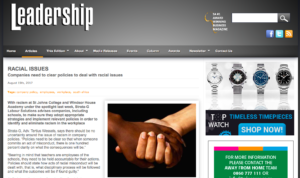 RACIAL ISSUES – Companies need clear policies to deal with racial issues. On Friday, November 17, the Department of Labour published the National Minimum Wage Bill that is set to introduce a minimum wage of R20 for each ordinary hour worked from May 2018. 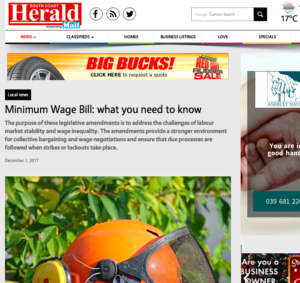 Businesses need to familiarise themselves with the National Minimum Wage Bill and the proposed amendments to the Basic Conditions of Employment Act and the Labour Relations Act to ensure they understand how these legislative changes will impact their business in the new year. According to experts, the recent postponement of suspended Eskom executive Mathsela Koko’s disciplinary hearing highlights just how costly and drawn out disciplinary procedures can be when lawyers become involved in the process. The biggest question usually asked by employees is : Under what circumstances does the employee have the right to engage legal representation in respect of a disciplinary hearing? What rights do employees have to legal representation during disciplinary hearings? The recent postponement of suspended Eskom executive Mathsela Koko’s disciplinary hearing highlights just how costly and drawn out disciplinary procedures can be when lawyers become involved in the process. © Vitaliy Vodolazskyy – 123RF.comIt also begs the question: Under what circumstances does the employee have the right to engage legal representation in respect of a disciplinary hearing? 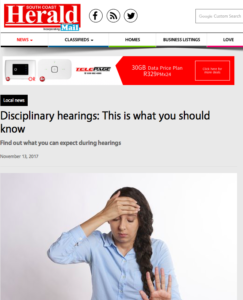 Disciplinary hearings and the employee’s right to legal representation. The recent postponement of suspended Eskom executive Matshela Koko’s disciplinary hearing highlights just how costly and drawn out disciplinary procedures can be when lawyers become involved in the process. It also begs the question: Under what circumstances does the employee have the right to engage legal representation in respect of a disciplinary hearing? 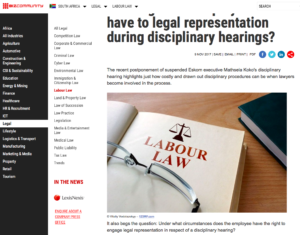 The Labour Relations Act is low-key on the issue of legal representation during disciplinary hearings. Transformation can work for you! 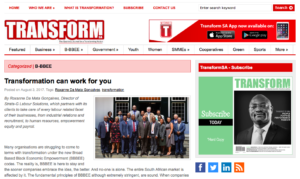 Many organisations are struggling to come to terms with transformation under the new Broad Based Black Economic Empowerment (BBBEE) codes. 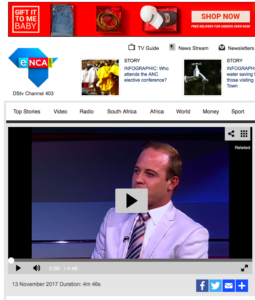 The reality is, BBBEE is here to stay and the sooner companies embrace the idea, the better. 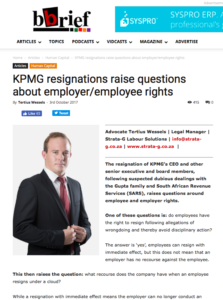 The resignation of KPMG’s CEO and other senior executive and board members, following suspected dubious dealings with the Gupta family and South African Revenue Services (SARS), raises questions around employee and employer rights.